Held five days after the Indianapolis 500 - a further reason to question the FIA's inclusion of the US race in its inaugural World Championship - the Swiss Grand Prix was a repeat of the Alfa Romeo one-two at Silverstone as Nino Farina took the chequered flag followed by Luigi Fagioli. And again, as at the British Grand Prix, Juan Manual Fangio's Alfa failed to last the distance. 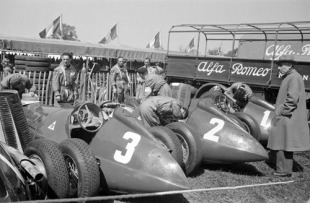 The only real competition to the Alfas was expected to come from the Ferraris of Alberto Ascari, Gigi Villoresi and Raymond Sommer but all were forced to retire. However, even in practice the Alfas had shown they were much more powerful. Fangio took an early lead but was passed by Farina on lap seven as the Alfas built a commanding 1-2-3 lead. Fagioli was unable to keep up and as the Ferraris wilted, Prince Bira moved into fourth. Philippe Etancelin in a Talbot Lago overtook him during a pit stop. On the 19th lap factory Talbot Lago driver Eugene Martin crashed heavily and was seriously hurt. Etancelin retired with gearbox trouble on the 25th lap, and Fangio followed seven laps from the end, leaving Talbot Lago factory driver Louis Rosier to take third ahead of four Maseratis.